The dog days of summer have never been more fun! It’s that time of year when community pools start holding their end-of-season dog swimming events. 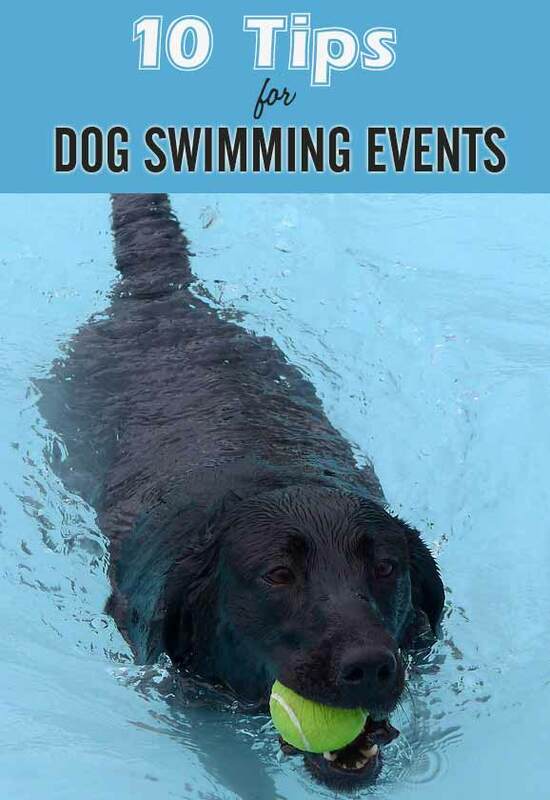 These doggie swims are getting more popular and one of our local pools even turned their annual event into a festival with free goodie bags, vendors, contests and an adoptable dog parade. Plus, they donate a portion of their admission fees to support local rescue groups. It doesn’t get any better than that! 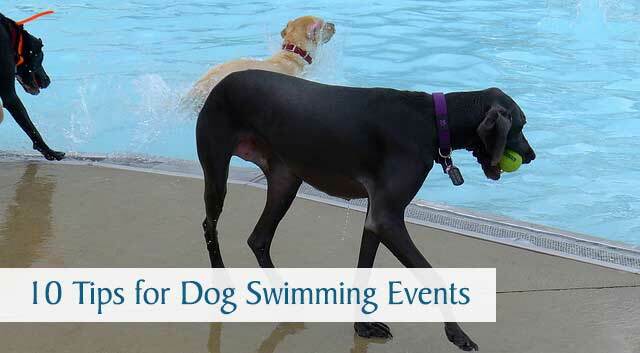 Even if you’re lucky enough to have your own pool, these events are a great opportunity to mingle with other canine-loving people while your dog socializes and plays with new pool pals. It’s amusing to watch so many dogs splash and romp around together, so get your pup ready to have some fun in the sun with these tips! Call or check your pool’s website for any rules you need to observe. Most require your dog to be licensed and current on their vaccinations. Some pools may require a vaccination record. If you’re at the pool during those hours of the day when the sun is intense, protect your pup with sunscreen. Choose a sunscreen made for dogs or babies and one that doesn’t contain zinc oxide. Dogs with pink noses and skin, shaved dogs and dogs with light-colored coats especially need protection from the sun. 3. Be a kind swim instructor. Visit pools that allow you to at least wade in the water with your dog. If your dog’s new to swimming, don’t throw them into the pool and expect their instincts to kick in. Instead, lead them in from the shallow end or steps and allow them time to adjust to the water. 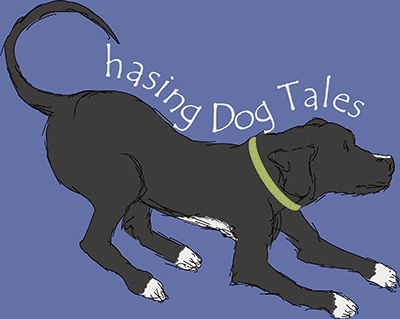 Support your dog under their belly while they gain confidence with their doggie paddling skills. Some dogs prefer to just walk and splash around in the shallow end and that’s fine too. 4. Show your dog how to get out of the pool. Lead your dog to the shallow end or steps several times so they know how to get out of the pool. Dogs may panic if they’re tired and want to get out, but forget where the steps are or they may injure themselves while trying to climb a vertical pool wall. 5. Consider buying a life jacket. 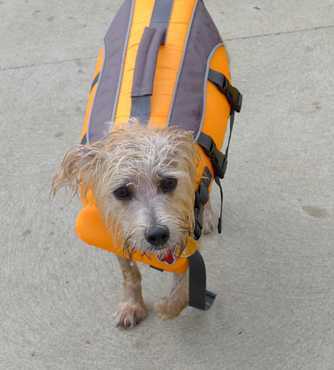 Some dogs are better swimmers than others and even those webbed-toed canines might enjoy wearing a life jacket once in a while. 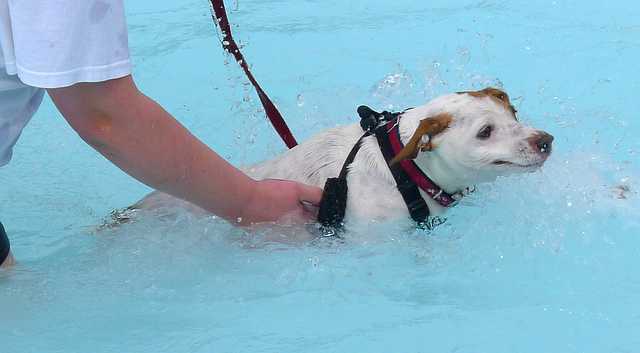 Dogs with short legs or short noses tend to have trouble swimming and will appreciate the extra buoyancy from a life jacket. Swimming is a strenuous activity and it’s especially important to be watchful of older and obese dogs to make sure they don’t overdo it and become exhausted. If you notice your dog is mostly vertical in the water with their rear end downward (instead of their body being horizontal with all four legs paddling), they’re probably having some trouble swimming or they’re getting tired. 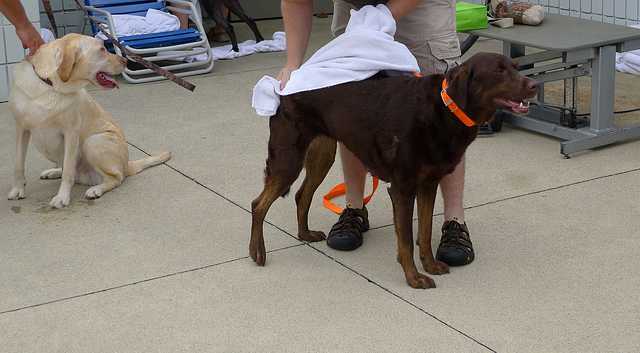 The rough concrete around pools can take a toll on your dog’s paw pads after a while. Check them occasionally for cuts or abrasions. I’ve also heard of dogs getting their toenails caught in the small drainage holes running along the top edge of some pools. 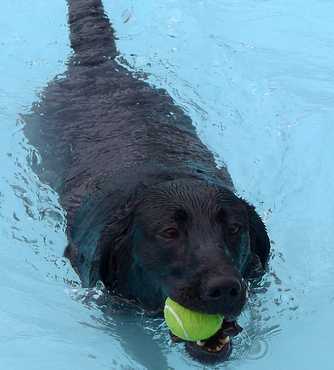 Tennis balls are a favorite toy at doggie pool parties, so be prepared to share. I usually observe a few people trying to chase down another person’s dog who swiped their pup’s toy. It happens, so it’s best to leave your dog’s favorite toys at home and don’t sweat it if a toy gets lost. 9. Take fresh drinking water. Most pools will provide drinking water for dogs, but I always take a few bottles of fresh water and a collapsible bowl, just in case. Haley’s kind of a water snob and she doesn’t care for sharing community water bowls. I don’t want her to drink chlorinated pool water if she gets really thirsty. 10. Rinse and dry your pup. Bathe or rinse your dog with clean water to remove any chorine or pool chemicals and be sure to dry their ears well to avoid ear infections. Don’t let these last few days of summer slip by without making plans to hang out beside the pool with your best friend! Contact your local swimming pools today and find out if they’re planning a dog swimming event soon. Have you ever attended an event like this with your dog? Did they enjoy it? What a smart idea! I had no idea community pools were welcoming dogs. It seems like a no-brainer to me. I know my little Boston terrier would totally dig that. The pug would sink like a rock, but she would paddle like crazy! I hope a local pool in your area is having a doggie swim this year, Jean. The pups would have a blast! Oh yes, pool time with our K9s is so much fun!! I wish we had our very own pool. When we used to live in apartment complexes, the pups got to enjoy a dip in the community pool at the end of the pool season. They always had a blast! We keep debating about whether to have a pool put in. It sure would be nice, wouldn’t it? ? Thanks, Linda! Enjoy the rest of the summer. ?